On September 23, 2018, the Australian Chinese Buddhist Research Centre (ACBRC) Melbourne Branch successfully held a large-scale Free Vegetarian Event at the Box Hill Town Hall to celebrate the Mid-Autumn Festival 2018, a favourite holiday for East Asian communities around the world. The event attracted over 1,200 people to attend. It promoted the culture and well-being of local communities with the gathering, thanksgiving and praying. In the meantime, the ACBRC used the opportunity to promote the upcoming Public Talk by Master Jun Hong Lu in Melbourne on November 11, 2018, which has gained wide attention. As the Chairman of the Australia Oriental Media Buddhist Charity Association, President of 2OR Australia Oriental Radio and the Australian Chinese Buddhist Research Centre (ACBRC), the founder of Guan Yin Citta Dharma Door, Buddhist Master Jun Hong Lu has been promoting the traditional Chinese culture, Buddhism and world peace for the last 20 years. He is also recognised as an “Ambassador for World Peace” and a world-renowned Chinese spiritual leader in the field of Buddhism with more than 10 million followers around the world. To ensure the smooth running of the event, volunteers had worked hard together and finished most of the preparation work at the Boxhill Town Hall previous day. At 8am, many volunteers arrived and started setting up booths and tables for different uses, such as registration. 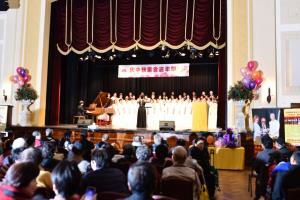 At around 10am, the guests were pouring into the hall and all seats were occupied quickly. Many people showed great interests in Master Lu’s Buddhist teachings and asked for Buddhist books, CDs and DVDs which were all distributed for free at the event. The President of the Australian Chinese Buddhist Association Melbourne Branch Sam Ding gave a welcome speech and introduction of the Association. Two distinguished guests, Cr. Tina Liu, the Elgar Ward Councillor for Whitehorse Community, and Cr. MT Pang Tsoi, the Mount Waverley Ward Councillor for Monash Community delivered appreciation remarks to thank the ACBRC for its many years of contributions to promoting the Chinese culture and promoting charitable activities. Volunteers from Guan Yin Citta brought a lot of joy and talent to the stage with series of amazing performances, including Chinese folk songs, choir singing by the ACBRC Youth Group, dance, and group performance of the traditional Chinese musical instruments “Guqin”. Many guests were impressed with the high-quality performance. Another highlight of the event is the diverse vegetarian cuisines provided to all the attendees for free. The wide variety of delicious dishes were all prepared by volunteers from Guan Yin Citta Dharma Door Melbourne branch and were served while the guests were enjoying the performances. These fine vegetarian foods earned high praise from the attendees and made them aware that vegetarian food can be a healthy alternative to meat-based meals. More importantly, having a vegetarian diet can save animals’ lives! The event was a huge success and attracted many new friends eager to learn Buddhism. It not only delighted the taste buds of the attendees, but also helped people recognise the importance of spiritual development in daily lives. At Master Jun Hong Lu’s Public Talk, you will have a chance to ask all kinds of questions and receive practical guidance on overcoming difficulties in daily life!